the lovely stretch of sandy beach on the coast. The beach here is known as Jumeirah Beach Residence and it’s lined with shops, restaurants, cafes and modern toilet facilities all set along an attractive walkway known as ‘The Walk’. There’s also an outdoor cinema showing films and football along with all the beach activities you’d expect. At the Marina itself, there are walkways on both sides lined with a handful of restaurants and shops. It’s absolutely huge and would take you quite a while to walk all the way around it, so choose a bit you like the look of to stroll along. It was never very busy when we walked here, but that helped to make it feel a relaxed place to be. The exclusive Dubai Marina Yacht Club is based in the Marina and the Dubai Marina Mall overlooks it. This shopping complex contains 140 stores and a supermarket. It’s located on the main road near the Jumeirah Lakes Towers metro stop. As this area of Dubai is still quite new, there’s a lot of construction work going on here. Even the roads are being dug up with the Dubai Metro being extended into the Marina district with a new ‘tramway’. This will make access here much easier as the metro red line is a ten minute walk from the beach front. The tramway will link up with the monorail on the Palm Jumeirah. 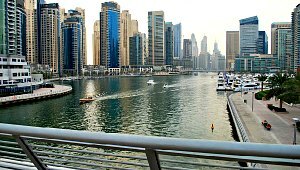 Dubai’s Marina district stretches for several kilometers from Palm Jumeirah to Jumeirah Lakes Towers.